The event also marked the launch of the #IAmTheRealAU initiative. #IAmTheRealAU invites students to post and share positive experiences with diversity at AU. 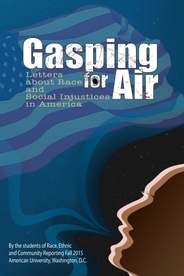 Associate Professor Angie Chuang had her class research and write to individuals who lost their lives in racially charged killings as part an impromptu exercise to teach about social injustices. Starting with the Black Lives Matter movement, students’ writings evolved to include letters to shooting victims of all races, police officers, students' own family members, and even perpetrators of racial violence. “When I saw how powerful the letters were I felt they needed to be seen by more people than me,” said Chuang. Learn more about the project and read selections from the book.